For as much as I love bright colors I also love grey. That lamp is just so beautiful, it looks like it has a texture on it too and that ring is just stunning! That bag is fantastic. I love all the shades of grey. I have been thinking of it for my new couch! Nice little round up of things in my favorite color! The rose gold /grey stone combo in that ring... wow, just striking! Grey is my go to these past few months. That bag is absolutely stunning! Amazing choices here! That ring, gorgeous! I think I've incorporated gray into every room, and pretty much into every outfit LOL! Love that Draper table! I've also been into wearing chrome accents lately vs. gold....not sure yet what that's about! Big big fan of gray.... and I have had my eye on that draper table for a long time! Wow, that bag it amazing -- WANT it! That ring is so unique! Love when white and grey are paired- so wintry and cool. I've been seriously craving some gray as well! It's the perfect neutral! The ostrich is amazing!! I love having such unique things in my home, definitely gets folks talking! I love all of your beautiful finds. I've been loving simple grey, black and white decor lately. Love the ostrich table and this bag is to die for!!! Grey is a timeless color so I understand you Albertina! 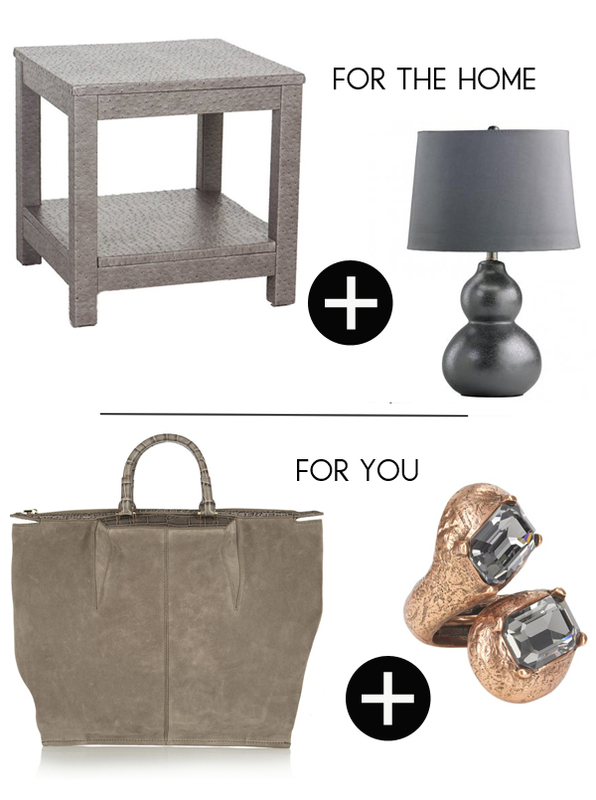 I think grey is my favorite neutral and this made me think I should use more of it in my home and not just wardrobe! That table is amazing and the bag is pretty fab too! I love grey, especially for interiors. Great finds! Grey is my favourite colour for interiors. The lamp is fab!